I suppose that it will be asked of me, "Why did you change the title of "Descarga Khanelonious" to "Descarga Canelón"?" Well, there was one main reason, and it actually was a sound business reason for doing it, at least in this case. Most composers of music belong to one of two societies which protect their 'performance' interests, those being either A.S.C.A.P. (The American Society of Composers, Authors, and Publishers) or B.M.I. (Broadcast Music, Inc.). In my case, I belong to B.M.I., and at various times throughout the year writers receive statements which document which tunes of ours have gotten played on the radio and/or television. IF one had recorded multiple versions of a particular tune, there really wouldn't be any effective way of knowing(IF you were at all curious) just which recorded version had gotten played. 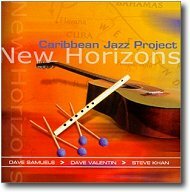 So, as "Descarga Khanelonious" was recorded in '93 for the "CROSSINGS"(Verve) CD, I decided that for the release of "NEW HORIZONS"(Concord Picante) by the Caribbean Jazz Project, I would slightly alter the title so that I could monitor just which version was actually getting airplay. So, that's more than enough of that story, let's move on to discuss the music. Though, on the surface, it might seem that the composition remained very much the same, it really has undergone some significant changes. These changes actually began when we first rehearsed this tune to be performed with the newly assembled Caribbean Jazz Project(which now features Dave Samuels: vibes and marimba; and Dave Valentin: flute) for an isolated concert date at the Bakersfield Jazz Festival. For this concert, we 'picked-up' a rhythm section from Los Angeles: Alex Acuña(timbales); Michito Sanchez(congas); and Eddie Resto(bass). After several run-throughs, they were all quick to point out that the tune goes in and out of clave, and in the world of Latin music, this is unacceptable. However, as there wasn't a lot of time to 'fix' these problems, because it was essentially one LONG rehearsal and then the concert, we just had to perform the piece as it was originally written. When we began to rehearse for "NEW HORIZONS," the reaction was much the same amongst bassist John Benitez and percussionists Richie Flores and Robert Vilera. The solution seemed to be in the elimination of several bars, especially from the [C] section. So, after much discussion and some trial and error, we cut out two bars and, what was once a symmetrical 16-bar section to my ears became a 14-bar section so that the piece would stay in clave. We also removed one bar from [C2] and from [C3]. And, in truth, so that the tune would end in clave as well, there's an 'extra' bar of rest in the 'cue' to end the piece. In addition to these details the clave changes, at various times, during the tune. For example, the guitar solo [D] is in 3-2, but both the vibes solo [E] and the flute solo [F] are in 2-3. In the main, I must thank John Benitez for most of the changes and deletions for it was his knowledge of clave and the traditions that helped to truly improve this piece. There was also a small written change I made in the bass tumbao which begins the tune. I have realized, and for a long time now, that I should have always written the high 'G' which appears on the and-of-two in bar one of [I] as a dotted 8th-note tied to a quarter note, but, originally it was written and played as a staccato 8th-note by Anthony Jackson. Here, the note gets the full value it should have always had and right away this is an improvement to the overall way the melodies 'sit' on top of it. One of the great things about playing with Dave Samuels and having the vibes as an added color to letter [A] of the tune is that now all the notes in each cluster can really speak clearly. I am specifically referring to the inclusion of the 'E' which appears on the 4th beat of the pick-up to the section. Frankly, for me to make the stretch required to include that note, well, it's just not in the cards with the size of my hands!!! I should also point out that the guitar montuno I play behind the vibes solo in letter [E] is actually a paraphrase of something Chick Corea originally played on the tune titled "Patato" which appears on an old Herbie Mann LP titled, "STANDING OVATION AT NEWPORT"(Atlantic), recorded in '65. Though the montuno I play behind Dave Valentin's solo in letter [F] is of my own making, in truth it is also really very much influenced by the way Chick Corea was playing Latin music in those years. I have never forgotten his playing on this LP and, of course, Cal Tjader's "SOUL BURST"(Verve). One other significant change should also be noted and that is there is now a change of key for the flute solo. On the original version of "Descarga Khanelonious" we used the [Tag] section to feature some interplay between Anthony Jackson and Dennis Chambers, keeping the section in its original key of Eb7. Here, for "Descarga Canelón," we use the section for a full flute solo and to give it a 'lift,' I decided to raise the key up a whole-step to F7. This was actually done at the very last minute, during the session, where the ending was tagged-on as well! One last change we made, this one thanks to the suggestion of Dave Samuels was to lessen the repeats of [A] and [B] when we reprise them after the vibes solo. So, in this version we go right to [B] and then play [A] before taking the coda sign and move on to the flute solo. I believe that the great lesson in all of this is that one must continue to listen to their bandmates and be flexible enough to try their suggestions. It's always possible that the new idea just might be better than what you had originally written. Often I feel that I'm learning and re-learning this lesson! I would also like to just add one last thought. No matter what or how much I may have learned about Latin music during all the time I've been involved with it, I can honestly tell you that I am constantly humbled by all that I do NOT know! The complexities of this music are just not to be believed and it is a constant thrill to try and learn as much as I can. The history of this music is deep and rich, and for those of you who are interested and inspired by it, I urge you to investigate it further. In the end, though one can NEVER play down the tremendous performances of Michael Brecker, Anthony Jackson, Dennis Chambers and Manolo Badrena, I truly feel that the composition was greatly improved for this interpretation, and it remains remarkable to me that Dave Samuels chose this tune to open the "NEW HORIZONS" CD just as it opened the "CROSSINGS" CD some 6 yrs. earlier. You want to create something which will enable your fellow musicians to read it with relative ease, so that by the 2nd or 3rd run-through, you are beginning to hear what your tune really sounds like. You might want to make certain that your lead sheet doesn't exceed three pages. The reason being that, IF there are music stands on a live gig, they usually can't hold more than three pages comfortably. Obviously this is an 'ideal,' and depending upon the composition, you might not be able to stick to this. If, at all possible, you want your lead sheet to read straight across from left to right. What I mean is that, ideally, you don't want to have the player going BACKWARDS on the chart too many times IF POSSIBLE. However, when you're trying to stick to a maximum of three pages, you WILL have to skillfully use repeats; D.C. and D.S. ; 1st and 2nd endings; coda signs, and perhaps even double-coda signs. When trying to calculate the number pages needed, you might need to see IF you can incorporate the bass part along with the melody sketch. If there's a keyboard in your group, you might have to make-up separate parts rather than using the mini-score format, which I happen to like. When you're lucky enough to be playing with a drummer with tremendous musicianship(like a Steve Gadd; Peter Erskine; Dave Weckl and others), these types of players LIKE to see the melody so that they can be interpreting the chart while they're even learning it. For these players, the more information you can give them, the better! A bassist like Anthony Jackson also loves to see the entire arrangement, as it helps shape his approach. You want your lead sheet to LOOK as it will sound, one should be able to SEE THE FORM. Give clear indications of the letter names for sections and IF at all possible, always try to keep your chart at 4 bars per system as most 'western' music is presented in four and eight-bar phrases. In a sense the 'golden rule' for treating people applies perfectly here. Treat your fellow musician as YOU would want to be treated...and that is, with respect. Make your chart look like what YOU would want to see. Give them the best chance to play it correctly as soon as is possible. I will hope that this addition to Jazzitalia has been helpful to those of you who visit us often.